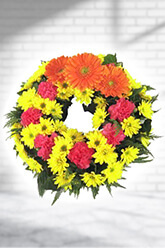 Gleaming orange, pink & yellow Gerberas, Carnations & Chrysanthemums set amongst greenery in a wreath. Ordered 9.30am SA time - delivered same day Karratha WA. Receiver was ecstatic with them. Very good service - George. Easy to use website. Following up e-mail after delivery. Thank you for all the help. The bouquet was beautiful according to my Mom! Ready flowers were great. I was able to change the delivery day the night before the new date. The flowers were delivered the morning of the new date. Fantastic service. Thank you zFlowers.com! All good. Funeral flowers so had to be perfect etc . Great job. Good service and communication. Delivered on time and receiver happy with it. Family really appreciated what you delivered.